Beautiful 2 bedroom 2 bath unit with excellent views of ocean and sound. Enjoy beautiful sunrises and sunsets, long sandy beaches, close to town yet quiet and out of the way. Excellent for hanging out and relaxing at the pool or beach. This is by far one of the nicest and closest properties to World Famous Gulfstrean fishing in Hatteras NC, 4 full service marinas with offshore and inshore charter fishing just moments away. Or take a free ferry ride to historic Ocracoke Village on Ocracoke Island, Just a few miles up the road is the house where Nights in Rodanthe was filmed. Elevator service to all levels makes Durant Station a most convenient choice for all ages: no need to haul luggage and groceries up long flights of stairs! Guests are just a few short steps to the ocean via a private wooden walkway. The Hatteras area offers some of the best fishing and sun bathing on the East Coast. At Durant Station you'll enjoy a host of amenities including one of Hatteras Island's largest private pools with an adjacent hot tub. The Durant Station Community Center is crowned by the original historic Durant Lifesaving Station tower, a rich piece of Hatteras Island's past. You'll find the Community Center ideal for relaxing with friends, conducting meetings, wedding parties and receptions, or simply enjoying the lounge areas, which offer a large-screen TV, and a complete kitchen on the upper level. The Durant Station Complex consists of three floors, which start about 12 feet above ground. The parking lot and walks are paved with concrete. The unit is tastefully furnished and fully equipped with linens to make your stay comfortable as well as memorable. Durant Station unit has central A/C, cable TV with HBO, Wireless High-speed Internet for your laptop, solid surface counters in the kitchen, and sprinkler safety systems for your peace of mind. Centrally located on the first floor is a coin operated laundry facility (which even offers an ocean view). . A large separate fish cleaning station, BBQ grill and outdoor shower complete the picture. The Durant Station is located in Hatteras Village, oceanfront on Highway 12. Enjoy being beachfront and near local restaurants and shops. Come and enjoy the solitude that is Hatteras Island. Enjoy Surf fishing, Surfing, Boogie Boarding, Shelling, Quiet walks on the beach, Relax at the pool. All without driving anywhere just 100 ft over the dune. Saturday / Saturday May to Sept.
Good trip... lovely condo. Great oceanfront deck! This condo was exactly as it said it was. Very clean and well stocked with all you needed for a great week. Met the owner (Mike) on the day we arrived..very nice and helpful. No issues all week and would definitely stay there again. Easy access to the beach and a great view of the sunrise from our deck. It was all better then expected! Perfect location, condo great! Would go back any time! Fun exploring various small towns on the island. Kids loved boat ride with Family Water Adventures, found tons of shells! Several good restaurants nearby too. This is a great unit and a great property. The unit was clean, furnished well and had a stocked kitchen. The view from the balcony is tremendous with plenty of room to eat outside. The pool, parking and beach access were all wonderful as well. 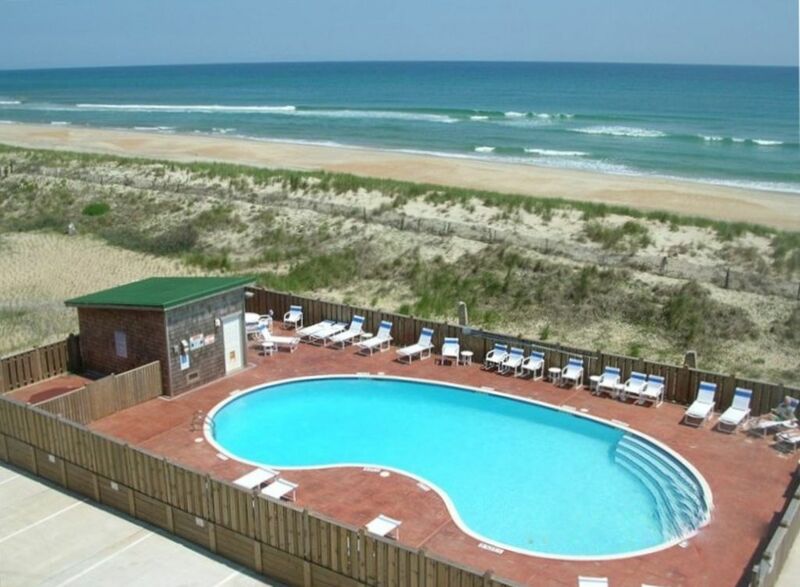 Hatteras is the place to stay to avoid the crowds in OBX, and this is the condo to stay at. I would highly recommend and will return in the future. This is by far one of the nicest and closest properties to World Famous Gulfstrean fishing in Hatteras NC, 4 fullservice marinas with offshore and inshore charter fishing just moments away. Or take a free ferry ride to historic Ocracoke Village on Ocracoke Island , Just a few mile up the road is the house where Nights in Rodanthe was filmed.